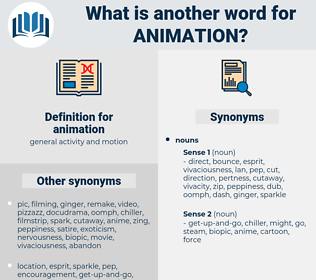 What is another word for animation? discouragement, laziness, calm, coolness, dullness, inactivity, apathy, calmness, lifelessness, lethargy, depression, sadness, idleness, indifference, enervation, unhappiness, coldness. weariness, tediousness, limpness, sluggishness, anemia, spiritlessness, pallidness, impassivity, languor, torpidity, vapidity, vapidness, torpor, languidness, sleepiness. Wharton, too, showed less than his usual animation.
" Then," cried Nora with sudden animation, " you are the very man I want." aminomethane, antedon, antitauon, antimuon, anatomy, antonym, anthidium, Anno Domini, anatotitan, amaethon, ammunition, anhedonia, amianthum, antony, antimony, annotation, amyotonia, anethum, antenna, antonymy, and then, anodyne, Antinomy, andean, antinomian, anthem, Anthony Wayne, anthony, anathema, antum.